If you live in the Salt Lake Valley…. If you would like to support a wonderful cause…. Then, I would love to see you this Saturday at Lizzie’s Bake Sale! Lizzie is a beautiful girl battling leukemia. All money made from the bake sale will go to her family. Now, for the recipe up for discussion today. I guess it would all depend on how you prefer this holiday standard. I myself, prefer the texture of dressing as opposed to stuffing. I’m not much of a fan for soggy. Don’t really like soggy anything actually. This recipe comes from my mother in law. It has a wonderful flavor. She always stuffs it in the good old bird. Really good, don’t get me wrong. and baked it in the oven separate from the bird. The Dressing turned out really well! I was very pleased to say the least. It had all of the great flavor we love, with an improved texture. I served it with White Chicken Chili. “Hey, be grateful for our bounty. 1. Slice your bread up into little pieces. 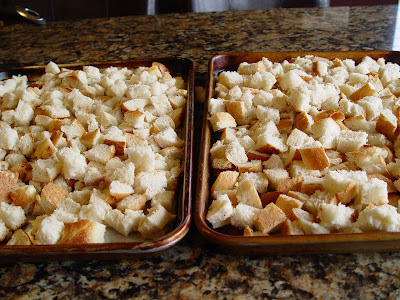 Pour them out onto two large baking sheets. 2.Pour 1/2 C melted butter over the tops of the cubes. 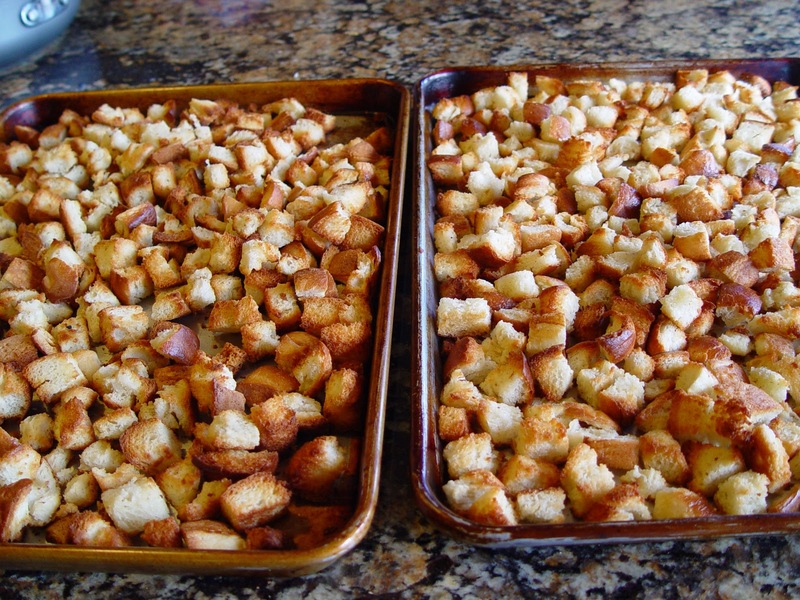 Use your hands to mix it all around so all of the cubes are evenly coated. 3. Toast you bread up by baking it in a 350 degree oven for about 25 minutes, or until golden brown. Stir the cubes about every 10 minutes. 4. While your bread is toasting, brown up your sausage. 5. 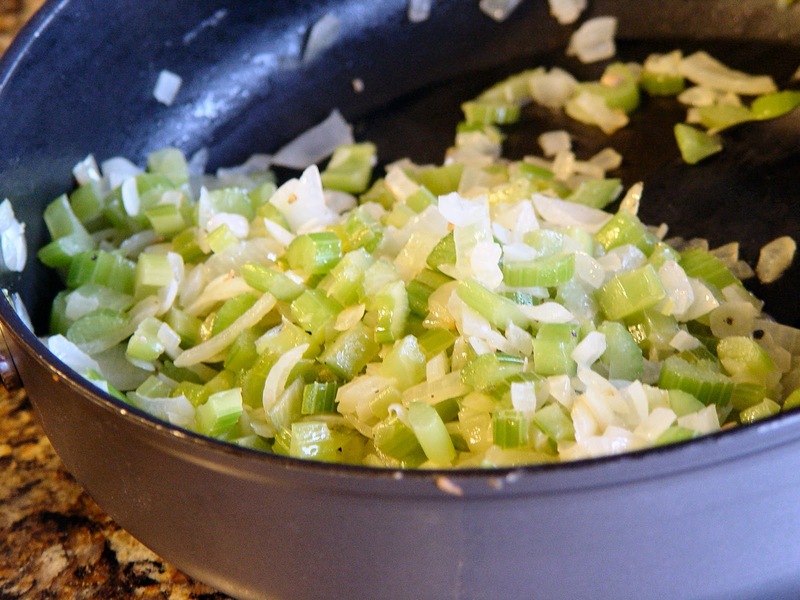 Chop up your celery and onions. 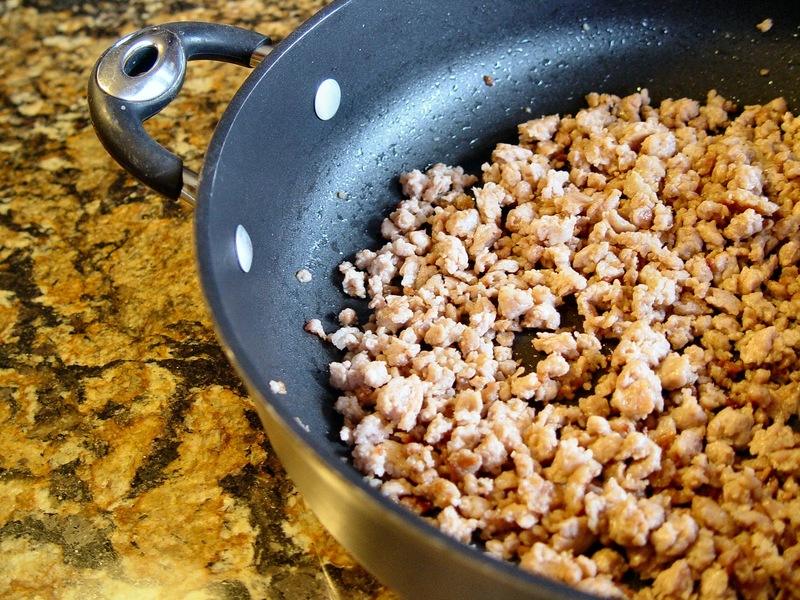 Melt 3 T butter in a large skillet. Add your veggies and saute until the onions are transparent and the celery is crisp tender. 6. In a large….and I mean large… mixing bowl combine all ingredients but the eggs. Mix well. Add the eggs and stir all around until well combined. 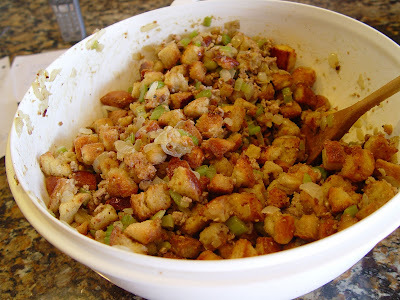 You don’t want any of the beaten eggs just hanging around in your stuffing un-mixed. Then you will have ScrambledEggDressingDelight. That might even be worst than soggy socks. Get them all mixed in, ok? 7. Spray a 9×13 pan with cooking spray. Pour your dressing into the pan and cover it tightly with tin foil. 8. Bake at 350 for 35 minutes. Serve hot from the oven. Jamie. This sounds delicious! 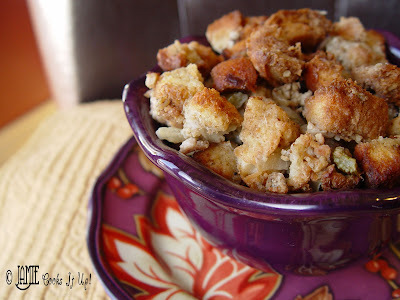 Can you make it ahead of time and bake it on Thanksgiving Day? I'm trying to find things I can do before the 'big day', so the day's not so BIG!!! If I were to make it ahead, I would toast the bread, saute the veggies, brown the sausage and store them separately until the morning of. Then mix all of the ingredients together and you will be good to go. Good luck. Hope you love it! I'm not sure if it would bind together very well without the eggs, however I think the taste would still be great. I would give it try, the extra broth would add moisture. Good luck! Let me know how it goes. Hi Jamie! Love your blog! What kind of sausage do you use for this dressing? I just used regular, bulk, Jimmy Dean Sausage. Good luck! I’m in love with this outfit, and adore this woman’s style. I don’t have that at 47 yrs. old, but I try. She inprises me. I love your blog,…and rush to it daily and have to just give you a big “Thank You” for the inspiration and ideas. I’ve never used sausage. could I use turkey giblets, chicken & chicken broth? The sausage really adds a lot of flavor. I would stick with it. 🙂 Good luck, and have a great holiday! I’ve been following your blog for years. I love your recipes. 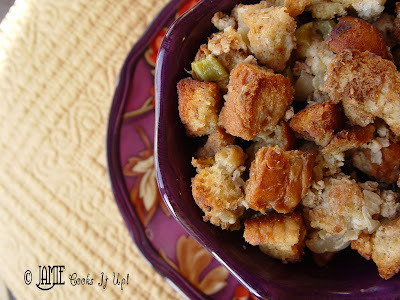 I’ve used this recipe for the past two Thanksgiving and will use it again this year. Your blog is one of my go to recipe blogs. Thanks for all your amazing recipes. 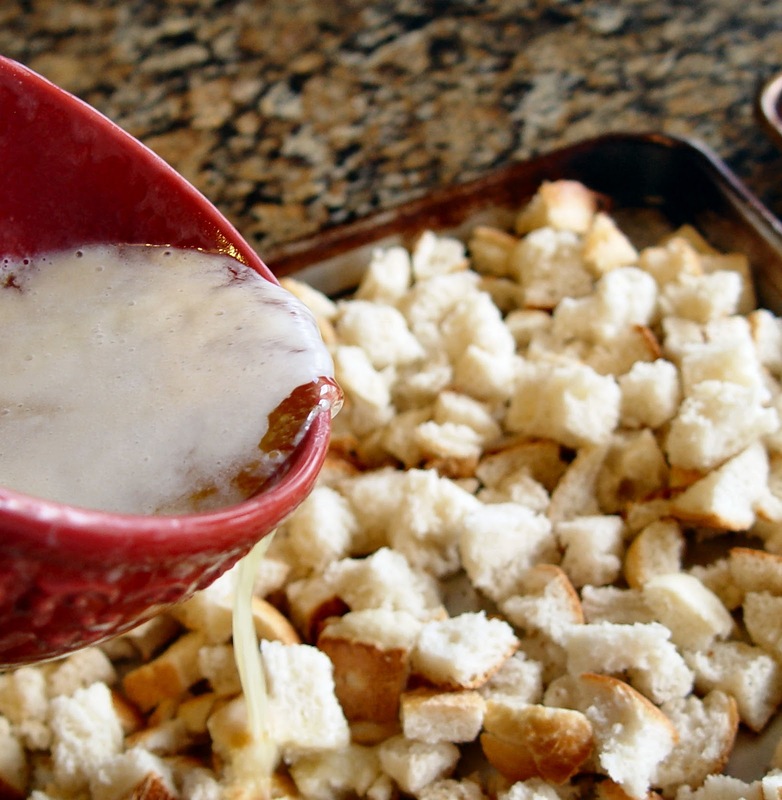 You listed 1/2 cup butter twice on the recipe… is the first 1/2 cup to toast the bread and the 2nd 1/2 cup part of what give the bread the moisture later on when you’re mixing it all together? Just wanted to make sure I had it right and it wasn’t a typo… thanks! How many cups of bread did you end up with for the dressing.